Welcome to our New Volkswagen offers and specials here in Thunder Bay. 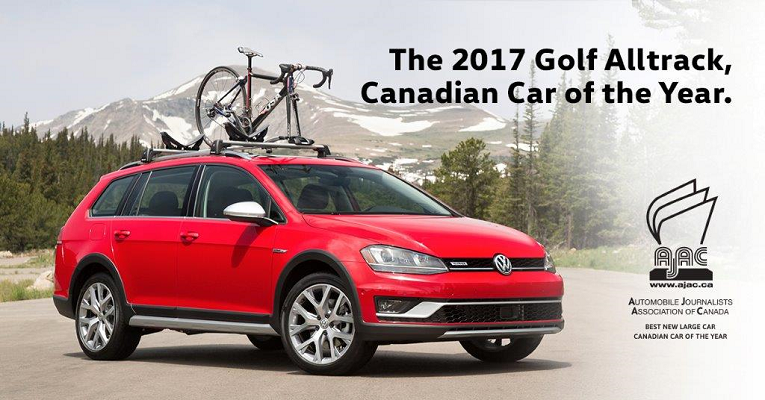 Get behind the wheel of a new 2017 Volkswagen Jetta, Tiguan, Passat, Golf or any other Volkswagen you choose today and take advantage of our offers available to you in Ontario. Check out our finance offers below and connect with our Downtown Volkswagen VW Sales Team. It’s Volkfest at Downtown Volkswagen in Ontario. Get some of our best financing deals on the 2017 Golf Alltrack, 2017 Golf SportWagen, 2017 Golf, 2017 Jetta, 2017 Passat, 2017 Tiguan, and the 2017 Touareg. You can save thousands (up to $4,000*) and finance new vehicles from as low as 0% for up to 72 months. * Don’ wait, these offers won’t last for long. Contact us today! 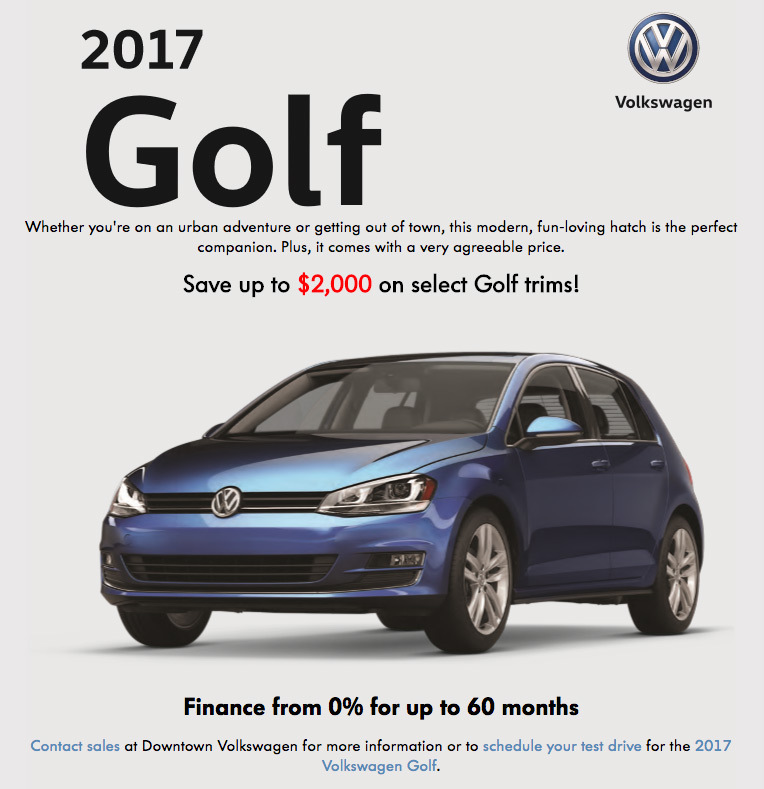 Contact sales at Downtown Volkswagen for more information or to schedule your test drive for the Thunder Bay Volkswagen of your choice. Ω$600 discount on MSRP available on finance purchase only (through Volkswagen Finance, on approved credit), of new and unregistered 2017 Jetta 1.4T Trendline base model with 5-speed manual transmission. §Limited time finance purchase offer available through Volkswagen Finance, on approved credit based on a new and unregistered 2017 Jetta 1.4T Trendline base model with 5-speed manual transmission with base ◊MSRP of $16,395 plus $1,645 freight and PDI, Financed at 0.99% APR for 84-months equals 182 bi-weekly payments starting from $99. $600 finance bonus cash has been applied in bi-weekly payment shown. $0 down payment, $22 EHF (tires), $10 OMVIC fee, $58 PPSA fee and up to $499 dealer administrative fee due at signing. Cost of borrowing is $676 for a total obligation of $18,642. ‡Up to $3,500 purchase discount available to be applied as a discount on MSRP on cash purchase only of new and unregistered 2017 Jetta Highline and GLI models. Discount varies by model. License, insurance, registration, options and applicable taxes are extra. Dealer may sell or lease for less. Dealer order/trade may be necessary. Offers end November 30, 2017 and are subject to change or cancellation without notice. Vehicle may not be exactly as shown. Visit your Volkswagen dealer for details. 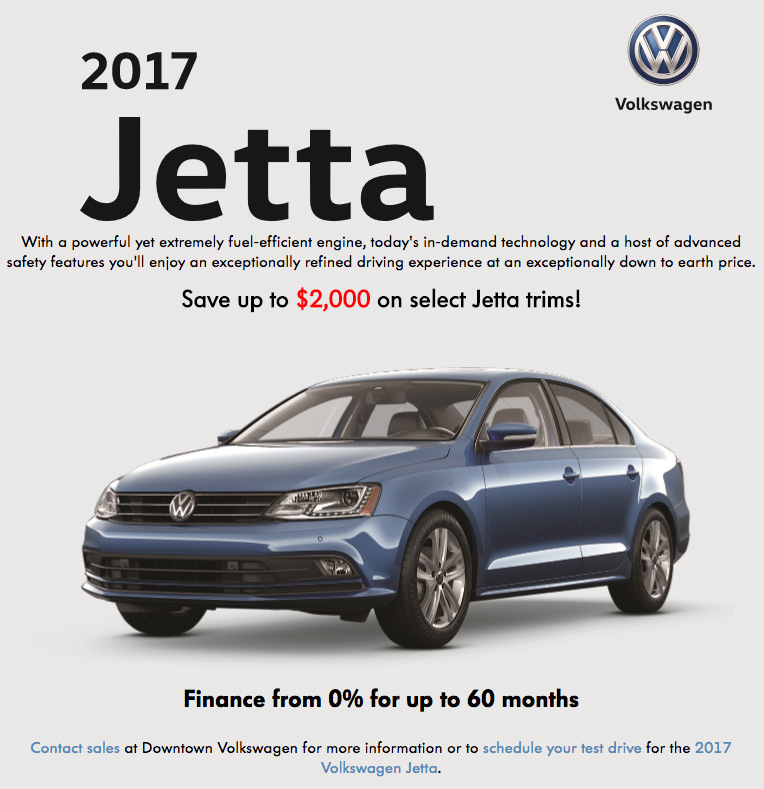 Ω$600 discount on MSRP available on finance purchase only (through Volkswagen Finance, on approved credit), of new and unregistered 2017 Jetta 1.4T Trendline base model with 5-speed manual transmission. §§Limited time finance purchase offer available through Volkswagen Finance, on approved credit based on a new and unregistered 2017 Jetta 1.4T Trendline base model with 5-speed manual transmission with base ◊MSRP of $16,395 plus $1,645 freight and PDI, Financed at 0% APR for 60-months equals 130 bi-weekly payments starting from $134. $600 finance bonus cash has been applied in bi-weekly payment shown. $0 down payment, $22 EHF (tires), $10 OMVIC fee, $58 PPSA fee and up to $499 dealer administrative fee due at signing. Cost of borrowing is $58 for a total obligation of $18,024. ‡Up to $3,500 purchase discount available to be applied as a discount on MSRP on cash purchase only of new and unregistered 2017 Jetta Highline and GLI models. Discount varies by model. License, insurance, registration, options and applicable taxes are extra. Dealer may sell or lease for less. Dealer order/trade may be necessary. Offers end November 30, 2017 and are subject to change or cancellation without notice. Vehicle may not be exactly as shown. Visit your Volkswagen dealer for details. §Limited time finance purchase offer available through Volkswagen Finance, on approved credit based on a new and unregistered 2017 Golf 1.8T Trendline 3-door base model with 5-speed manual transmission with base ◊MSRP of $19,595 plus $1,645 freight and PDI, Financed at 3.99% APR for 84-months equals 182 bi-weekly payments starting from $134. $0 down payment, $22 EHF (tires), $100 air-conditioning levy, $10 OMVIC fee, $58 PPSA fee and up to $499 dealer administrative fee due at signing. Cost of borrowing is $3,197 for a total obligation of $25,063. License, insurance, registration, options and applicable taxes are extra. Dealer may sell or lease for less. Dealer order/trade may be necessary. Offers end November 30, 2017 and are subject to change or cancellation without notice. Vehicle may not be exactly as shown. Visit your Volkswagen dealer for details. §Limited time finance purchase offer available through Volkswagen Finance, on approved credit based on a new and unregistered 2018 Beetle 1.8T base model with 5-speed manual transmission with base ◊MSRP of $21,895 plus $1,645 freight and PDI, Financed at 4.99% APR for 84-months equals 182 bi-weekly payments starting from $136. $2,668 down payment, $22 EHF (tires), $100 air-conditioning levy, $10 OMVIC fee, $58 PPSA fee and up to $499 dealer administrative fee due at signing. Cost of borrowing is $3,957 for a total obligation of $28,123. License, insurance, registration, options and applicable taxes are extra. Dealer may sell or lease for less. Dealer order/trade may be necessary. Offers end November 30, 2017 and are subject to change or cancellation without notice. Vehicle may not be exactly as shown. Visit your Volkswagen dealer for details. Ω$775 discount on MSRP available on finance purchase only (through Volkswagen Finance, on approved credit), of new and unregistered 2017 Tiguan 2.0T FWD Trendline base model with 6-speed automatic transmission. §Limited time finance purchase offer available through Volkswagen Finance, on approved credit based on a new and unregistered 2017 Tiguan 2.0T FWD Trendline base model with 6-speed automatic transmission with base ◊MSRP of $25,990 plus $1,795 freight and PDI, Financed at 0.99% APR for 84-months equals 182 bi-weekly payments starting from $154. $775 finance bonus cash has been applied in bi-weekly payment shown. $0 down payment, $22 EHF (tires), $100 air-conditioning levy, $10 OMVIC fee, $58 PPSA fee and up to $499 dealer administrative fee due at signing. Cost of borrowing is $1,015 for a total obligation of $28,651. ‡Up to $2,750 purchase discount available to be applied as a discount on MSRP on cash purchase only of select new and unregistered 2017 Tiguan Comfortline and Highline models. Discount varies by model. License, insurance, registration, options and applicable taxes are extra. Dealer may sell or lease for less. Dealer order/trade may be necessary. Offers end November 30, 2017 and are subject to change or cancellation without notice. Vehicle may not be exactly as shown. Visit your Volkswagen dealer for details. Ω$775 discount on MSRP available on finance purchase only (through Volkswagen Finance, on approved credit), of new and unregistered 2017 Tiguan 2.0T FWD Trendline base model with 6-speed automatic transmission. §§Limited time finance purchase offer available through Volkswagen Finance, on approved credit based on a new and unregistered 2017 Tiguan 2.0T FWD Trendline base model with 6-speed automatic transmission with base ◊MSRP of $25,990 plus $1,795 freight and PDI, Financed at 0% APR for 72-months equals 156 bi-weekly payments starting from $173. $775 finance bonus cash has been applied in bi-weekly payment shown. $0 down payment, $22 EHF (tires), $100 air-conditioning levy, $10 OMVIC fee, $58 PPSA fee and up to $499 dealer administrative fee due at signing. Cost of borrowing is $58 for a total obligation of $27,694. 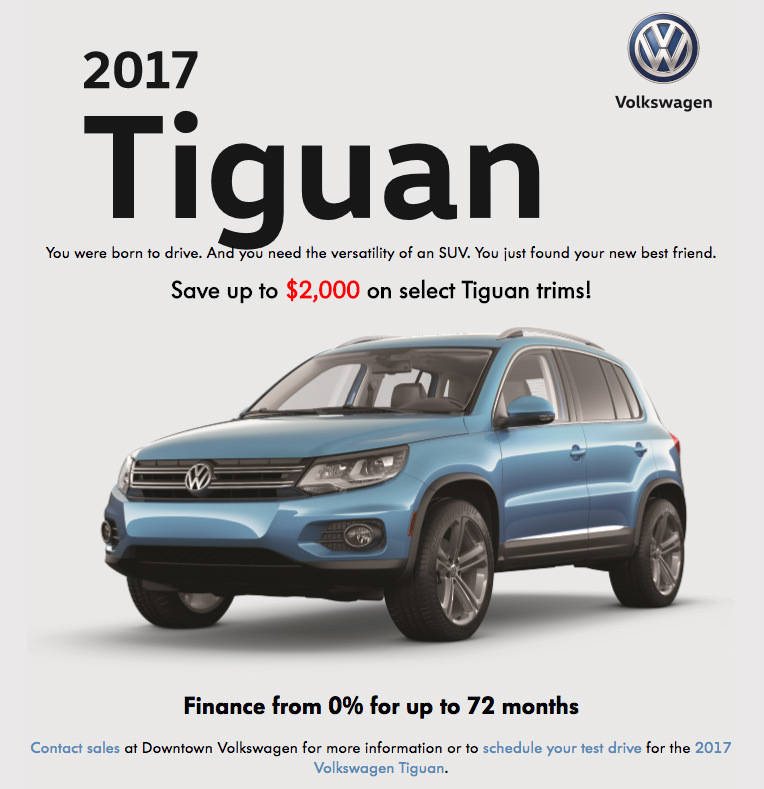 ‡Up to $2,750 purchase discount available to be applied as a discount on MSRP on cash purchase only of select new and unregistered 2017 Tiguan Comfortline and Highline models. Discount varies by model. License, insurance, registration, options and applicable taxes are extra. Dealer may sell or lease for less. Dealer order/trade may be necessary. Offers end November 30, 2017 and are subject to change or cancellation without notice. Vehicle may not be exactly as shown. Visit your Volkswagen dealer for details. 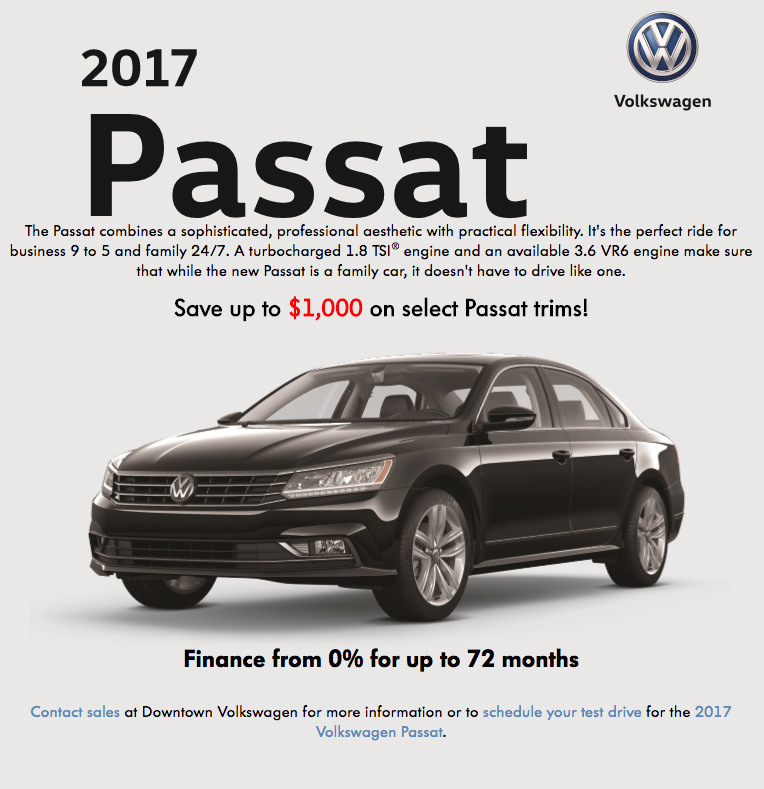 §Limited time finance purchase offer available through Volkswagen Finance, on approved credit based on a new and unregistered 2017 Passat 1.8T Trendline+ model with 6-speed automatic transmission with base ◊MSRP of $25,745 plus $1,695 freight and PDI, Financed at 0.99% APR for 84-months equals 182 bi-weekly payments starting from $156. $0 down payment, $22 EHF (tires), $100 air-conditioning levy, $10 OMVIC fee, $58 PPSA fee and up to $499 dealer administrative fee due at signing. Cost of borrowing is $1,032 for a total obligation of $29,128. License, insurance, registration, options and applicable taxes are extra. Dealer may sell or lease for less. Dealer order/trade may be necessary. Offers end November 30, 2017 and are subject to change or cancellation without notice. Vehicle may not be exactly as shown. Visit your Volkswagen dealer for details. §Limited time finance purchase offer available through Volkswagen Finance, on approved credit based on a new and unregistered 2018 Golf 1.8T SportWagen base model with 5-speed manual transmission with base ◊MSRP of $24,195 plus $1,645 freight and PDI, Financed at 3.99% APR for 84-months equals 182 bi-weekly payments starting from $163. $0 down payment, $22 EHF (tires), $100 air-conditioning levy, $10 OMVIC fee, $58 PPSA fee and up to $499 dealer administrative fee due at signing. Cost of borrowing is $3,876 for a total obligation of $30,342. License, insurance, registration, options and applicable taxes are extra. Dealer may sell or lease for less. Dealer order/trade may be necessary. Offers end November 30, 2017 and are subject to change or cancellation without notice. Vehicle may not be exactly as shown. Visit your Volkswagen dealer for details. §Limited time finance purchase offer available through Volkswagen Finance, on approved credit based on a new and unregistered 2018 Beetle Convertible 1.8T base model with 6-speed automatic transmission with base ◊MSRP of $25,895 plus $1,645 freight and PDI, Financed at 4.99% APR for 84-months equals 182 bi-weekly payments starting from $164. $2,461 down payment, $22 EHF (tires), $100 air-conditioning levy, $10 OMVIC fee, $58 PPSA fee and up to $499 dealer administrative fee due at signing. Cost of borrowing is $4,743 for a total obligation of $32,909. License, insurance, registration, options and applicable taxes are extra. Dealer may sell or lease for less. Dealer order/trade may be necessary. Offers end November 30, 2017 and are subject to change or cancellation without notice. Vehicle may not be exactly as shown. Visit your Volkswagen dealer for details. 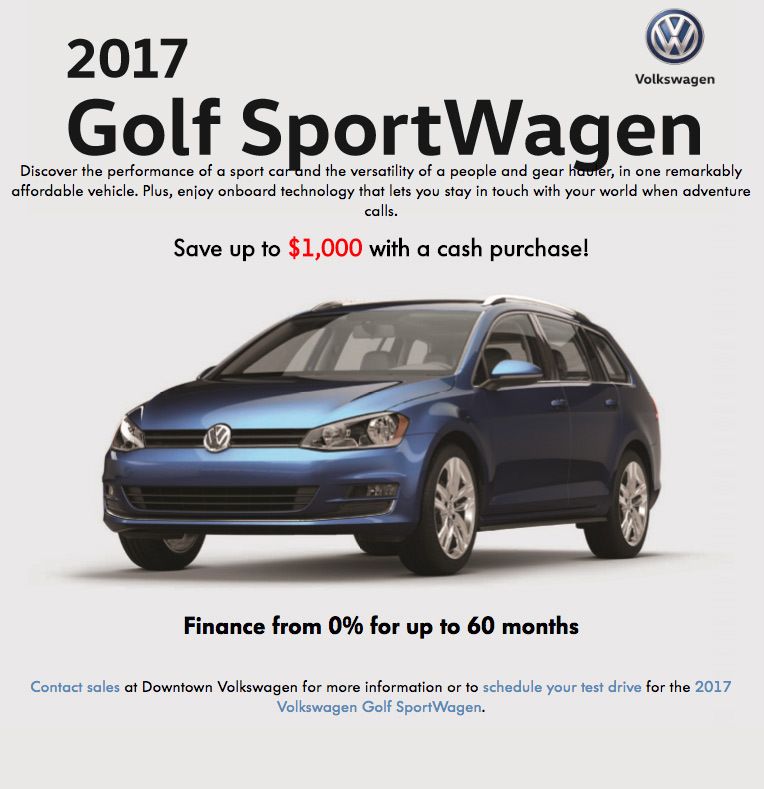 §Limited time finance purchase offer available through Volkswagen Finance, on approved credit based on a new and unregistered 2018 Golf SportWagen 1.8T model with 6-speed automatic transmission with Tiptronic 4MOTION with base ◊MSRP of $25,695 plus $1,645 freight and PDI, Financed at 3.99% APR for 84-months equals 182 bi-weekly payments starting from $172. $0 down payment, $22 EHF (tires), $100 air-conditioning levy, $10 OMVIC fee, $58 PPSA fee and up to $499 dealer administrative fee due at signing. Cost of borrowing is $4,098 for a total obligation of $32,064. License, insurance, registration, options and applicable taxes are extra. Dealer may sell or lease for less. Dealer order/trade may be necessary. Offers end November 30, 2017 and are subject to change or cancellation without notice. Vehicle may not be exactly as shown. Visit your Volkswagen dealer for details. §Limited time finance purchase offer available through Volkswagen Finance, on approved credit based on a new and unregistered 2018 Passat 1.8T Trendline+ model with 6-speed automatic transmission with base ◊MSRP of $26,195 plus $1,725 freight and PDI, Financed at 3.99% APR for 84-months equals 182 bi-weekly payments starting from $176. $0 down payment, $22 EHF (tires), $100 air-conditioning levy, $10 OMVIC fee, $58 PPSA fee and up to $499 dealer administrative fee due at signing. Cost of borrowing is $4,179 for a total obligation of $32,695. License, insurance, registration, options and applicable taxes are extra. Dealer may sell or lease for less. Dealer order/trade may be necessary. Offers end November 30, 2017 and are subject to change or cancellation without notice. Vehicle may not be exactly as shown. Visit your Volkswagen dealer for details. §Limited time finance purchase offer available through Volkswagen Finance, on approved credit based on a new and unregistered 2018 Golf GTI 2.0T model with 6-speed manual transmission with base ◊MSRP of $30,595 plus $1,645 freight and PDI, Financed at 3.99% APR for 84-months equals 182 bi-weekly payments starting from $186. $2,721 down payment, $22 EHF (tires), $100 air-conditioning levy, $10 OMVIC fee, $58 PPSA fee and up to $499 dealer administrative fee due at signing. Cost of borrowing is $4,420 for a total obligation of $37,286. License, insurance, registration, options and applicable taxes are extra. Dealer may sell or lease for less. Dealer order/trade may be necessary. Offers end November 30, 2017 and are subject to change or cancellation without notice. Vehicle may not be exactly as shown. Visit your Volkswagen dealer for details. §Limited time finance purchase offer available through Volkswagen Finance, on approved credit based on a new and unregistered 2018 Tiguan 2.0T FWD Trendline base model with 6-speed automatic transmission with base ◊MSRP of $28,925 plus $1,845 freight and PDI, Financed at 3.99% APR for 84-months equals 182 bi-weekly payments starting from $194. $0 down payment, $22 EHF (tires), $100 air-conditioning levy, $10 OMVIC fee, $58 PPSA fee and up to $499 dealer administrative fee due at signing. Cost of borrowing is $4,605 for a total obligation of $36,001. License, insurance, registration, options and applicable taxes are extra. Dealer may sell or lease for less. Dealer order/trade may be necessary. Offers end November 30, 2017 and are subject to change or cancellation without notice. Vehicle may not be exactly as shown. Visit your Volkswagen dealer for details. Ω$1,500 discount on MSRP available on finance purchase only (through Volkswagen Finance, on approved credit), of new and unregistered 2017 Jetta GLI 2.0T base model with 6-speed manual transmission. §Limited time finance purchase offer available through Volkswagen Finance, on approved credit based on a new and unregistered 2017 Jetta GLI 2.0T base model with 6-speed manual transmission with base ◊MSRP of $34,995 plus $1,645 freight and PDI, Financed at 0.99% APR for 84-months equals 182 bi-weekly payments starting from $200. $1,500 finance bonus cash has been applied in bi-weekly payment shown. $0 down payment, $22 EHF (tires), $100 air-conditioning levy, $10 OMVIC fee, $58 PPSA fee and up to $499 dealer administrative fee due at signing. Cost of borrowing is $1,304 for a total obligation of $37,070. ‡Up to $3,500 purchase discount available to be applied as a discount on MSRP on cash purchase only of new and unregistered 2017 Jetta Highline and GLI models. Discount varies by model. License, insurance, registration, options and applicable taxes are extra. Dealer may sell or lease for less. Dealer order/trade may be necessary. Offers end November 30, 2017 and are subject to change or cancellation without notice. Vehicle may not be exactly as shown. Visit your Volkswagen dealer for details. §Limited time finance purchase offer available through Volkswagen Finance, on approved credit based on a new and unregistered 2018 Tiguan 2.0T 4MOTION Trendline base model with 6-speed automatic transmission with base ◊MSRP of $31,175 plus $1,845 freight and PDI, Financed at 3.99% APR for 84-months equals 182 bi-weekly payments starting from $208. $0 down payment, $22 EHF (tires), $100 air-conditioning levy, $10 OMVIC fee, $58 PPSA fee and up to $499 dealer administrative fee due at signing. Cost of borrowing is $4,938 for a total obligation of $38,584. License, insurance, registration, options and applicable taxes are extra. Dealer may sell or lease for less. Dealer order/trade may be necessary. Offers end November 30, 2017 and are subject to change or cancellation without notice. Vehicle may not be exactly as shown. Visit your Volkswagen dealer for details. 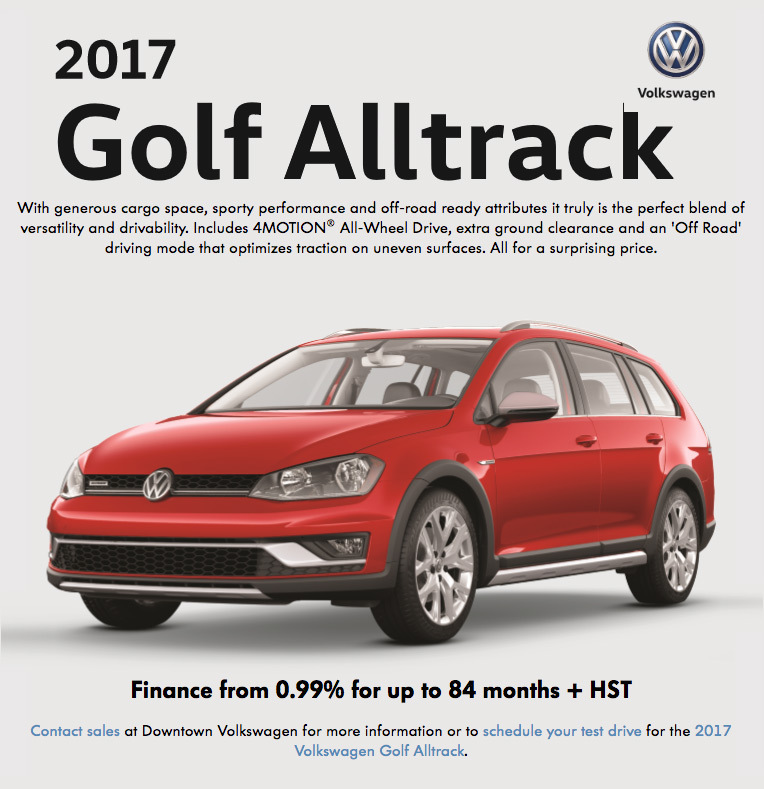 §Limited time finance purchase offer available through Volkswagen Finance, on approved credit based on a new and unregistered 2018 Golf Alltrack 1.8T model with 6-speed automatic transmission with base ◊MSRP of $35,745 plus $1,645 freight and PDI, Financed at 3.99% APR for 84-months equals 182 bi-weekly payments starting from $236. $0 down payment, $22 EHF (tires), $100 air-conditioning levy, $10 OMVIC fee, $58 PPSA fee and up to $499 dealer administrative fee due at signing. Cost of borrowing is $5,583 for a total obligation of $43,599. License, insurance, registration, options and applicable taxes are extra. Dealer may sell or lease for less. Dealer order/trade may be necessary. Offers end November 30, 2017 and are subject to change or cancellation without notice. Vehicle may not be exactly as shown. Visit your Volkswagen dealer for details. §Limited time finance purchase offer available through Volkswagen Finance, on approved credit based on a new and unregistered 2018 Atlas base model with 8-speed automatic transmission with base ◊MSRP of $35,690 plus $1,845 freight and PDI, Financed at 3.99% APR for 84-months equals 182 bi-weekly payments starting from $237. $0 down payment, $22 EHF (tires), $100 air-conditioning levy, $10 OMVIC fee, $58 PPSA fee and up to $499 dealer administrative fee due at signing. Cost of borrowing is $5,605 for a total obligation of $43,766. License, insurance, registration, options and applicable taxes are extra. Dealer may sell or lease for less. Dealer order/trade may be necessary. Offers end November 30, 2017 and are subject to change or cancellation without notice. Vehicle may not be exactly as shown. Visit your Volkswagen dealer for details. §Limited time finance purchase offer available through Volkswagen Finance, on approved credit based on a new and unregistered 2018 Atlas base model with 8-speed automatic transmission with base ◊MSRP of $39,790 plus $1,845 freight and PDI, Financed at 3.99% APR for 84-months equals 182 bi-weekly payments starting from $263. $0 down payment, $22 EHF (tires), $100 air-conditioning levy, $10 OMVIC fee, $58 PPSA fee and up to $499 dealer administrative fee due at signing. Cost of borrowing is $6,211 for a total obligation of $48,472. License, insurance, registration, options and applicable taxes are extra. Dealer may sell or lease for less. Dealer order/trade may be necessary. Offers end November 30, 2017 and are subject to change or cancellation without notice. Vehicle may not be exactly as shown. Visit your Volkswagen dealer for details. §Limited time finance purchase offer available through Volkswagen Finance, on approved credit based on a new and unregistered 2018 Golf R 2.0T base model with 6-speed manual 4MOTION transmission with base ◊MSRP of $42,065 plus $1,645 freight and PDI, Financed at 4.99% APR for 84-months equals 182 bi-weekly payments starting from $285. $0 down payment, $22 EHF (tires), $100 air-conditioning levy, $10 OMVIC fee, $58 PPSA fee and up to $499 dealer administrative fee due at signing. Cost of borrowing is $8,225 for a total obligation of $52,561. License, insurance, registration, options and applicable taxes are extra. Dealer may sell or lease for less. Dealer order/trade may be necessary. Offers end November 30, 2017 and are subject to change or cancellation without notice. Vehicle may not be exactly as shown. Visit your Volkswagen dealer for details. §Limited time finance purchase offer available through Volkswagen Finance, on approved credit based on a new and unregistered 2017 Touareg base model with 8-speed automatic transmission with base ◊MSRP of $51,960 plus $1,795 freight and PDI, Financed at 2.99% APR for 84-months equals 182 bi-weekly payments starting from $294. $5,470 down payment, $22 EHF (tires), $100 air-conditioning levy, $10 OMVIC fee, $58 PPSA fee and up to $499 dealer administrative fee due at signing. Cost of borrowing is $5,347 for a total obligation of $59,728. 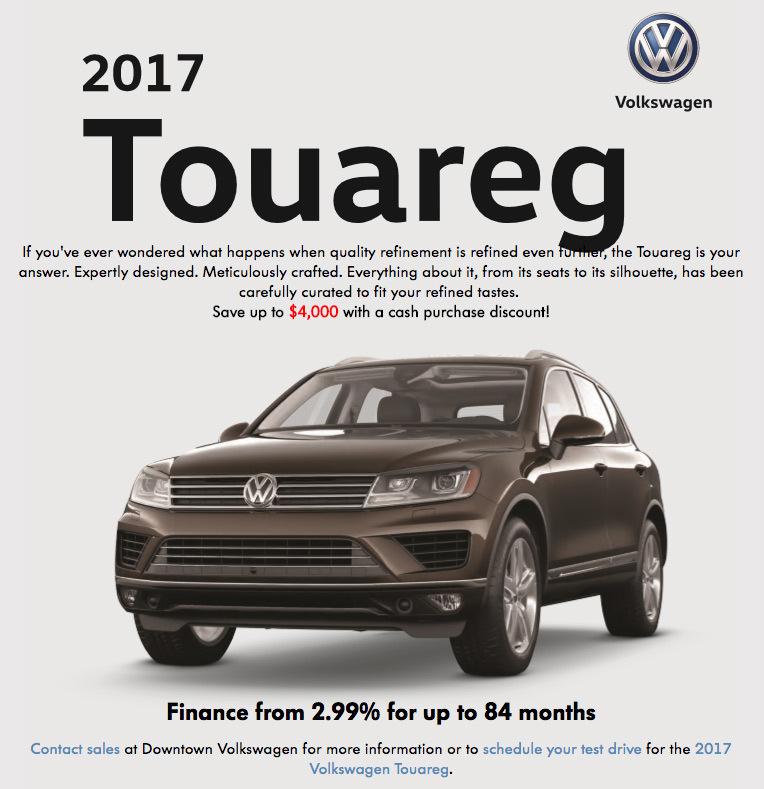 ‡Up to $4,000 purchase discount available to be applied as a discount on MSRP on cash purchase only of new and unregistered 2017 Touareg models. License, insurance, registration, options and applicable taxes are extra. Dealer may sell or lease for less. Dealer order/trade may be necessary. Offers end November 30, 2017 and are subject to change or cancellation without notice. Vehicle may not be exactly as shown. Visit your Volkswagen dealer for details. Ω$600 discount on MSRP available on lease only (through Volkswagen Finance, on approved credit), of new and unregistered 2017 Jetta 1.4T Trendline base model with 5-speed manual transmission model. ΔLimited time lease offer available through Volkswagen Finance, on approved credit, based on a new and unregistered 2017 Jetta 1.4T Trendline base model with 5-speed manual transmission. $1,645 freight and PDI included in monthly payment. 60-month term at 1.49% APR with monthly payments of $213. $600 lease bonus cash has been applied in monthly payment shown. $0 down payment, $260 security deposit, $22 EHF (tires), $10 OMVIC fee, $58 PPSA fee and up to $499 dealer administrative fee and first monthly payment due at lease inception. Total lease obligation: $13,364. 80,000-kilometre allowance; charge of $0.15/km for excess kilometres. ‡Up to $3,500 purchase discount available to be applied as a discount on MSRP on cash purchase only of new and unregistered 2017 Jetta Highline and GLI models. Discount varies by model. License, insurance, registration, options and applicable taxes are extra. Dealer may sell or lease for less. Dealer order/trade may be necessary. Offers end November 30, 2017 and are subject to change or cancellation without notice. Vehicle may not be exactly as shown. Visit your Volkswagen dealer for details. ΔLimited time lease offer available through Volkswagen Finance, on approved credit, based on a new and unregistered 2017 Golf 1.8T Trendline 3-door base model with 5-speed manual transmission. $1,645 freight and PDI included in monthly payment. 60-month term at 3.49% APR with monthly payments of $248. $0 down payment, $300 security deposit, $22 EHF (tires), $100 air-conditioning levy, $10 OMVIC fee, $58 PPSA fee and up to $499 dealer administrative fee and first monthly payment due at lease inception. Total lease obligation: $15,564. 80,000-kilometre allowance; charge of $0.15/km for excess kilometres. License, insurance, registration, options and applicable taxes are extra. Dealer may sell or lease for less. Dealer order/trade may be necessary. Offers end November 30, 2017 and are subject to change or cancellation without notice. Vehicle may not be exactly as shown. Visit your Volkswagen dealer for details. ΔLimited time lease offer available through Volkswagen Finance, on approved credit, based on a new and unregistered 2018 Beetle 1.8T base model with 5-speed manual transmission. $1,645 freight and PDI included in monthly payment. 48-month term at 2.99% APR with monthly payments of $302. $0 down payment, $350 security deposit, $22 EHF (tires), $100 air-conditioning levy, $10 OMVIC fee, $58 PPSA fee and up to $499 dealer administrative fee and first monthly payment due at lease inception. Total lease obligation: $15,180. 64,000-kilometre allowance; charge of $0.15/km for excess kilometres. License, insurance, registration, options and applicable taxes are extra. Dealer may sell or lease for less. Dealer order/trade may be necessary. Offers end November 30, 2017 and are subject to change or cancellation without notice. Vehicle may not be exactly as shown. Visit your Volkswagen dealer for details. ΔLimited time lease offer available through Volkswagen Finance, on approved credit, based on a new and unregistered 2018 Golf 1.8T SportWagen base model with 5-speed manual transmission. $1,645 freight and PDI included in monthly payment. 60-month term at 3.49% APR with monthly payments of $318. $0 down payment, $370 security deposit, $22 EHF (tires), $100 air-conditioning levy, $10 OMVIC fee, $58 PPSA fee and up to $499 dealer administrative fee and first monthly payment due at lease inception. Total lease obligation: $19,764. 80,000-kilometre allowance; charge of $0.15/km for excess kilometres. License, insurance, registration, options and applicable taxes are extra. Dealer may sell or lease for less. Dealer order/trade may be necessary. Offers end November 30, 2017 and are subject to change or cancellation without notice. Vehicle may not be exactly as shown. Visit your Volkswagen dealer for details. ΔLimited time lease offer available through Volkswagen Finance, on approved credit, based on a new and unregistered 2018 Golf SportWagen 1.8T model with 6-speed automatic transmission with Tiptronic 4MOTION. $1,645 freight and PDI included in monthly payment. 36-month term at 1.99% APR with monthly payments of $334. $2,125 down payment, $380 security deposit, $22 EHF (tires), $100 air-conditioning levy, $10 OMVIC fee, $58 PPSA fee and up to $499 dealer administrative fee and first monthly payment due at lease inception. Total lease obligation: $14,833. 48,000-kilometre allowance; charge of $0.15/km for excess kilometres. License, insurance, registration, options and applicable taxes are extra. Dealer may sell or lease for less. Dealer order/trade may be necessary. Offers end November 30, 2017 and are subject to change or cancellation without notice. Vehicle may not be exactly as shown. Visit your Volkswagen dealer for details. ΔLimited time lease offer available through Volkswagen Finance, on approved credit, based on a new and unregistered 2017 Passat 1.8T Trendline+ model with 6-speed automatic transmission. $1,695 freight and PDI included in monthly payment. 60-month term at 2.49% APR with monthly payments of $338. $0 down payment, $390 security deposit, $22 EHF (tires), $100 air-conditioning levy, $10 OMVIC fee, $58 PPSA fee and up to $499 dealer administrative fee and first monthly payment due at lease inception. Total lease obligation: $20,964. 80,000-kilometre allowance; charge of $0.15/km for excess kilometres. License, insurance, registration, options and applicable taxes are extra. Dealer may sell or lease for less. Dealer order/trade may be necessary. Offers end November 30, 2017 and are subject to change or cancellation without notice. Vehicle may not be exactly as shown. Visit your Volkswagen dealer for details. ΔLimited time lease offer available through Volkswagen Finance, on approved credit, based on a new and unregistered 2018 Passat 1.8T Trendline+ model with 6-speed automatic transmission. $1,725 freight and PDI included in monthly payment. 60-month term at 3.49% APR with monthly payments of $339. $0 down payment, $390 security deposit, $22 EHF (tires), $100 air-conditioning levy, $10 OMVIC fee, $58 PPSA fee and up to $499 dealer administrative fee and first monthly payment due at lease inception. Total lease obligation: $21,024. 80,000-kilometre allowance; charge of $0.15/km for excess kilometres. License, insurance, registration, options and applicable taxes are extra. Dealer may sell or lease for less. Dealer order/trade may be necessary. Offers end November 30, 2017 and are subject to change or cancellation without notice. Vehicle may not be exactly as shown. Visit your Volkswagen dealer for details. ΔLimited time lease offer available through Volkswagen Finance, on approved credit, based on a new and unregistered 2018 Beetle Convertible 1.8T base model with 6-speed automatic transmission. $1,645 freight and PDI included in monthly payment. 48-month term at 2.99% APR with monthly payments of $340. $0 down payment, $390 security deposit, $22 EHF (tires), $100 air-conditioning levy, $10 OMVIC fee, $58 PPSA fee and up to $499 dealer administrative fee and first monthly payment due at lease inception. Total lease obligation: $17,004. 64,000-kilometre allowance; charge of $0.15/km for excess kilometres. License, insurance, registration, options and applicable taxes are extra. Dealer may sell or lease for less. Dealer order/trade may be necessary. Offers end November 30, 2017 and are subject to change or cancellation without notice. Vehicle may not be exactly as shown. Visit your Volkswagen dealer for details. Ω$775 discount on MSRP available on lease only (through Volkswagen Finance, on approved credit), of new and unregistered 2017 Tiguan 2.0T FWD Trendline base model with 6-speed automatic transmission model. ΔLimited time lease offer available through Volkswagen Finance, on approved credit, based on a new and unregistered 2017 Tiguan 2.0T FWD Trendline base model with 6-speed automatic transmission. $1,795 freight and PDI included in monthly payment. 60-month term at 2.49% APR with monthly payments of $341. $775 lease bonus cash has been applied in monthly payment shown. $0 down payment, $390 security deposit, $22 EHF (tires), $100 air-conditioning levy, $10 OMVIC fee, $58 PPSA fee and up to $499 dealer administrative fee and first monthly payment due at lease inception. Total lease obligation: $21,144. 80,000-kilometre allowance; charge of $0.15/km for excess kilometres. ‡Up to $2,750 purchase discount available to be applied as a discount on MSRP on cash purchase only of select new and unregistered 2017 Tiguan Comfortline and Highline models. Discount varies by model. License, insurance, registration, options and applicable taxes are extra. Dealer may sell or lease for less. Dealer order/trade may be necessary. Offers end November 30, 2017 and are subject to change or cancellation without notice. Vehicle may not be exactly as shown. Visit your Volkswagen dealer for details. ΔLimited time lease offer available through Volkswagen Finance, on approved credit, based on a new and unregistered 2018 Golf GTI 2.0T model with 6-speed manual transmission. $1,645 freight and PDI included in monthly payment. 48-month term at 2.99% APR with monthly payments of $377. $0 down payment, $430 security deposit, $22 EHF (tires), $100 air-conditioning levy, $10 OMVIC fee, $58 PPSA fee and up to $499 dealer administrative fee and first monthly payment due at lease inception. Total lease obligation: $18,780. 64,000-kilometre allowance; charge of $0.15/km for excess kilometres. License, insurance, registration, options and applicable taxes are extra. Dealer may sell or lease for less. Dealer order/trade may be necessary. Offers end November 30, 2017 and are subject to change or cancellation without notice. Vehicle may not be exactly as shown. Visit your Volkswagen dealer for details. ΔLimited time lease offer available through Volkswagen Finance, on approved credit, based on a new and unregistered 2018 Tiguan 2.0T FWD Trendline base model with 6-speed automatic transmission. $1,845 freight and PDI included in monthly payment. 36-month term at 1.99% APR with monthly payments of $429. $0 down payment, $480 security deposit, $22 EHF (tires), $100 air-conditioning levy, $10 OMVIC fee, $58 PPSA fee and up to $499 dealer administrative fee and first monthly payment due at lease inception. Total lease obligation: $16,128. 48,000-kilometre allowance; charge of $0.15/km for excess kilometres. License, insurance, registration, options and applicable taxes are extra. Dealer may sell or lease for less. Dealer order/trade may be necessary. Offers end November 30, 2017 and are subject to change or cancellation without notice. Vehicle may not be exactly as shown. Visit your Volkswagen dealer for details. ΔLimited time lease offer available through Volkswagen Finance, on approved credit, based on a new and unregistered 2018 Tiguan 2.0T 4MOTION Trendline base model with 6-speed automatic transmission. $1,845 freight and PDI included in monthly payment. 36-month term at 1.99% APR with monthly payments of $429. $700 down payment, $480 security deposit, $22 EHF (tires), $100 air-conditioning levy, $10 OMVIC fee, $58 PPSA fee and up to $499 dealer administrative fee and first monthly payment due at lease inception. Total lease obligation: $16,828. 48,000-kilometre allowance; charge of $0.15/km for excess kilometres. License, insurance, registration, options and applicable taxes are extra. Dealer may sell or lease for less. Dealer order/trade may be necessary. Offers end November 30, 2017 and are subject to change or cancellation without notice. Vehicle may not be exactly as shown. Visit your Volkswagen dealer for details. ΔLimited time lease offer available through Volkswagen Finance, on approved credit, based on a new and unregistered 2018 Golf Alltrack 1.8T model with 6-speed automatic transmission. $1,645 freight and PDI included in monthly payment. 60-month term at 3.49% APR with monthly payments of $466. $0 down payment, $520 security deposit, $22 EHF (tires), $100 air-conditioning levy, $10 OMVIC fee, $58 PPSA fee and up to $499 dealer administrative fee and first monthly payment due at lease inception. Total lease obligation: $28,644. 80,000-kilometre allowance; charge of $0.15/km for excess kilometres. License, insurance, registration, options and applicable taxes are extra. Dealer may sell or lease for less. Dealer order/trade may be necessary. Offers end November 30, 2017 and are subject to change or cancellation without notice. Vehicle may not be exactly as shown. Visit your Volkswagen dealer for details. Ω$1,500 discount on MSRP available on lease only (through Volkswagen Finance, on approved credit), of new and unregistered 2017 Jetta GLI 2.0T base model with 6-speed manual transmission model. ΔLimited time lease offer available through Volkswagen Finance, on approved credit, based on a new and unregistered 2017 Jetta GLI 2.0T base model with 6-speed manual transmission. $1,645 freight and PDI included in monthly payment. 60-month term at 2.49% APR with monthly payments of $475. $1,500 lease bonus cash has been applied in monthly payment shown. $0 down payment, $530 security deposit, $22 EHF (tires), $100 air-conditioning levy, $10 OMVIC fee, $58 PPSA fee and up to $499 dealer administrative fee and first monthly payment due at lease inception. Total lease obligation: $29,184. 80,000-kilometre allowance; charge of $0.15/km for excess kilometres. ‡Up to $3,500 purchase discount available to be applied as a discount on MSRP on cash purchase only of new and unregistered 2017 Jetta Highline and GLI models. Discount varies by model. License, insurance, registration, options and applicable taxes are extra. Dealer may sell or lease for less. Dealer order/trade may be necessary. Offers end November 30, 2017 and are subject to change or cancellation without notice. Vehicle may not be exactly as shown. Visit your Volkswagen dealer for details. ΔLimited time lease offer available through Volkswagen Finance, on approved credit, based on a new and unregistered 2018 Atlas base model with 8-speed automatic transmission. $1,845 freight and PDI included in monthly payment. 36-month term at 1.99% APR with monthly payments of $507. $0 down payment, $560 security deposit, $22 EHF (tires), $100 air-conditioning levy, $10 OMVIC fee, $58 PPSA fee and up to $499 dealer administrative fee and first monthly payment due at lease inception. Total lease obligation: $18,936. 48,000-kilometre allowance; charge of $0.35/km for excess kilometres. License, insurance, registration, options and applicable taxes are extra. Dealer may sell or lease for less. Dealer order/trade may be necessary. Offers end November 30, 2017 and are subject to change or cancellation without notice. Vehicle may not be exactly as shown. Visit your Volkswagen dealer for details. ΔLimited time lease offer available through Volkswagen Finance, on approved credit, based on a new and unregistered 2018 Atlas base model with 8-speed automatic transmission. $1,845 freight and PDI included in monthly payment. 36-month term at 1.99% APR with monthly payments of $537. $0 down payment, $590 security deposit, $22 EHF (tires), $100 air-conditioning levy, $10 OMVIC fee, $58 PPSA fee and up to $499 dealer administrative fee and first monthly payment due at lease inception. Total lease obligation: $20,016. 48,000-kilometre allowance; charge of $0.15/km for excess kilometres. License, insurance, registration, options and applicable taxes are extra. Dealer may sell or lease for less. Dealer order/trade may be necessary. Offers end November 30, 2017 and are subject to change or cancellation without notice. Vehicle may not be exactly as shown. Visit your Volkswagen dealer for details. ΔLimited time lease offer available through Volkswagen Finance, on approved credit, based on a new and unregistered 2018 Golf R 2.0T base model with 6-speed manual 4MOTION transmission. $1,645 freight and PDI included in monthly payment. 48-month term at 4.99% APR with monthly payments of $584. $0 down payment, $630 security deposit, $22 EHF (tires), $100 air-conditioning levy, $10 OMVIC fee, $58 PPSA fee and up to $499 dealer administrative fee and first monthly payment due at lease inception. Total lease obligation: $28,716. 64,000-kilometre allowance; charge of $0.15/km for excess kilometres. License, insurance, registration, options and applicable taxes are extra. Dealer may sell or lease for less. Dealer order/trade may be necessary. Offers end November 30, 2017 and are subject to change or cancellation without notice. Vehicle may not be exactly as shown. Visit your Volkswagen dealer for details. ΔLimited time lease offer available through Volkswagen Finance, on approved credit, based on a new and unregistered 2017 Touareg base model with 8-speed automatic transmission. $1,795 freight and PDI included in monthly payment. 48-month term at 2.99% APR with monthly payments of $719. $0 down payment, $770 security deposit, $22 EHF (tires), $100 air-conditioning levy, $10 OMVIC fee, $58 PPSA fee and up to $499 dealer administrative fee and first monthly payment due at lease inception. Total lease obligation: $35,196. 64,000-kilometre allowance; charge of $0.35/km for excess kilometres. ‡Up to $4,000 purchase discount available to be applied as a discount on MSRP on cash purchase only of new and unregistered 2017 Touareg models. License, insurance, registration, options and applicable taxes are extra. Dealer may sell or lease for less. Dealer order/trade may be necessary. Offers end November 30, 2017 and are subject to change or cancellation without notice. Vehicle may not be exactly as shown. Visit your Volkswagen dealer for details.